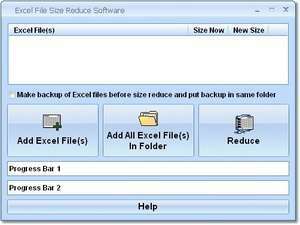 This software offers a solution for users who want to reduce the file size of one or more Excel files. Excel 2000, 2002, XP and 2003 often seem to assume a larger number of rows and columns than is actually used, resulting in over-sized files. Using this software, even large numbers of files can be processed. The user simply chooses the files or an entire folder before starting the process. Excel File Size Reduce Software 7.0 is a shareware program and can be used as a demo to try the software until the free trial period has ended. A full version of the program is available after the trial period ends. For security reasons, you should also check out the Excel File Size Reduce Software download at LO4D.com which includes virus and malware tests. Additional screenshots of this application download may be available, too. Excel File Size Reduce Software has a presence on social networks.